So let's say you've been studying hard, attended many levels of Japanese language courses, and have poured your heart and soul into the effort to achieve that "bilingual" mark. But through your studying experience, you frequently doubt yourself or find trouble seeing how your hard work will pay off. Sure, no longer needing subtitles to play your imported Japanese video games, or to watch your internet pirated anime is cool, but what does it all mean? When and how can you officially say you are "fluent" or "proficient" to a specific degree in the language? 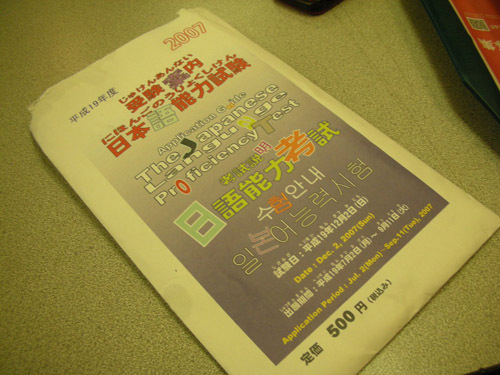 I'm sure you are all aware of English as a second language tests that exist, such as TOEFL or TOEIC. Well, on the flipside, Japan has the same thing. 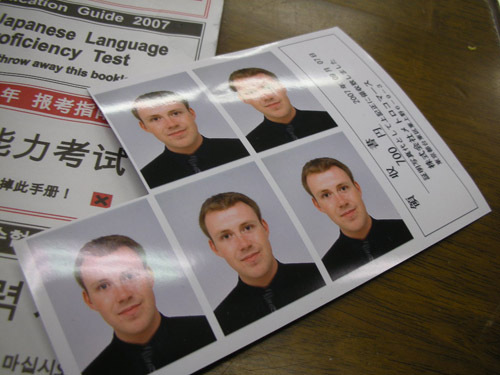 Awhile back a system was put together to be able to gauge a foreigner's ability in the Japanese language, supplying them, or potential employers, with a defined benchmark of proficiency. 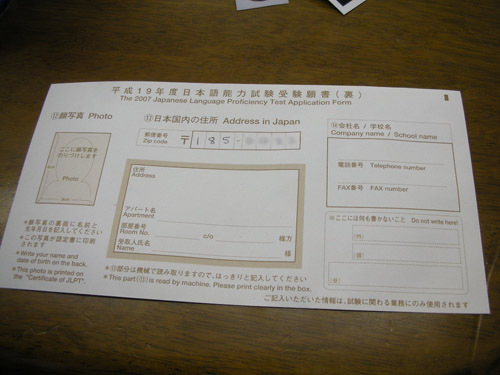 This test goes by the name of the Japanese Language Proficiency Test, or JLPT for short. After passing a specific level of the JLPT, you then acquire a certified "degree" of sorts, that is recognized country-wide as assuring and stating your level of proficiency in the Japanese language. Here's how the test breaks down. 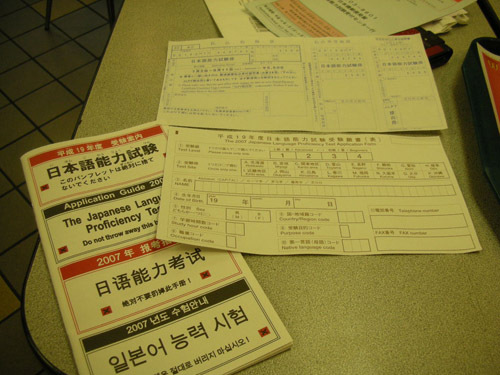 The JLPT has four levels of proficiency, 1 being the highest level, and 4 being the lowest. The JLPT tests on three sections, reading comprehension, listening, and grammar (over-simplified explanation of the sections but you get the general idea). Inside the first section, grammar, you are tested on various grammatical structures, kanji recognition, etc. For this section you are given 45 minutes, with 65 questions, valued at a total of 100pts. The second section, listening, tests you on listening comprehension, takes 45 minutes, has something like 13 bigger questions, and counts for another 100pts. The final, and most difficult section, reading comprehension, takes 90 minutes, has you read compositions and answer tricky questions about the content, and is worth 200pts total. Reading comprehension is especially difficult due to the amount of kanji combonations you are required to know (words made of kanji, the frilly chinese characters people usually tattoo on themselves in America). So what does each level mean? Level 4 is the easiest and is said to require 150 total hours of study, requiring knowledge of 103 kanji, and a relatively beginner level of grammar. Level 3 jumps to about 300 hours of total study, 285 total kanji, and a beginner to intermediate level of grammar. Level 2, a huuuuge jump, required 600+ hours of total study, requires knowledge of roughly 1050 kanji, 6000 words, and an intermediate to lower advanced level of grammar. The level 1, which is rarely reached by western foreigners from my understanding, places you at about the same fleuncy level in the language as a Japanese high school graduate. You are at 900+ hours of total study, over 2000kanji, and closer to 12,000 word vocabulary with a highly advanced level of grammar. 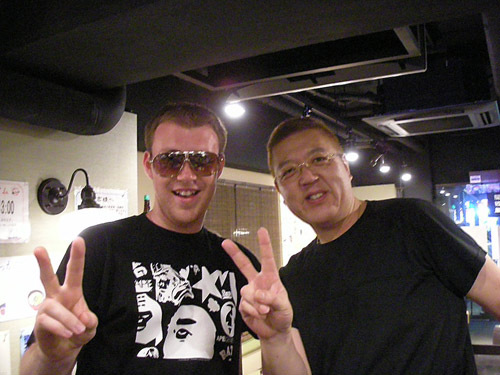 With a level 2 or level 1 (refered to as Ni-Kyuu and Ii-kyuu), you begin having the ability to work in real Japanese society and be able to read write and speak closer to a native Japanese person. Don't be confused though, even with 1kyuu, you are ways away from translator status. To pass these tests, 4-2kyuu require a 60% and the 1kyuu requires a 70% score. Ok great, sounds not too bad right? Wrong, the test is only given once a year on December 2nd in only a few select locations. You also have to go through a long process of application almost 6 months in advance. This year I decided to brave it and go for 2kyuu. Here is how I went about applying and getting set up to take the test. First thigns first, got to get all sexied up for a nice professional photo to put on your official application form. McDonalds. One thing I really want to point out here. I am so effing tired of people asking me this super old misconception of Japan, so I'll set it straight now. 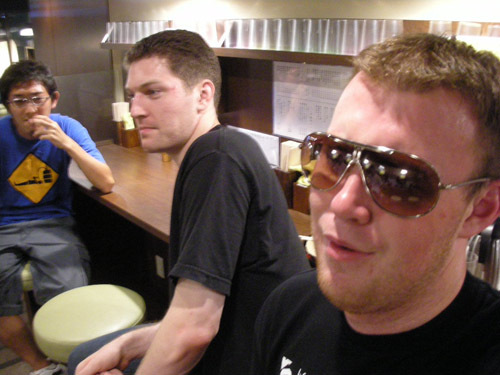 "Durrr so like uh, in Japan everything is hella expensive right? My cousin's friend's mom's cowoker's pet groomer said he went to Japan and a Bic Mac meal was like $20 and he never lies. Super reliable source. How do you afford it?" NO, for fudge's sake, McDonalds is either the same price or cheaper then the states. 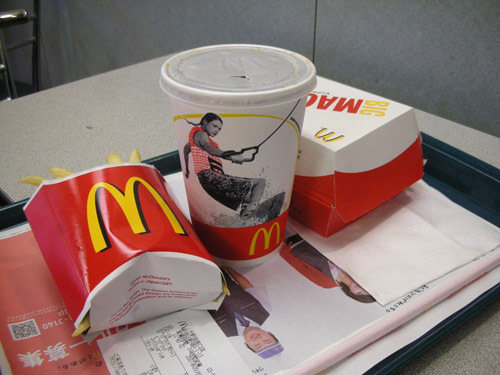 A big mac meal is like 550yen-ish right now which is $4.78. Things that're expensive in Tokyo are just what is expensive in big cities, same as how certain things are expensive in Manhattan or downtown San Francisco(i.e. apartments). 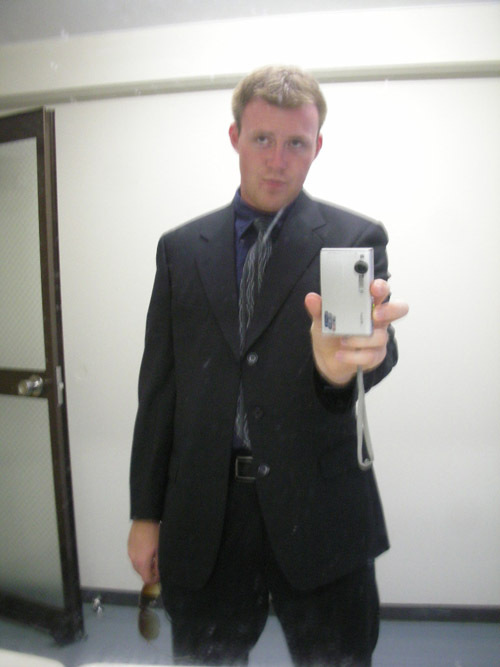 With that cleared up, I realized I needed to get a special sized picture of myself for my application. At practically every station in tokyo there are these little picture booths that serve just this purpose. For many applications (work, visa, etc. ), people require these uniformed sized pictures of about 3mmX4mm. At these booths for about 500 yen you can get a sheet of these proof pictures. 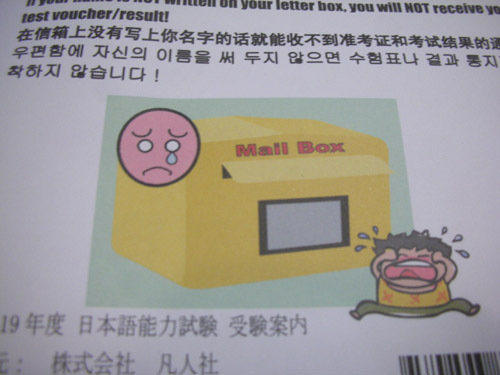 On the back of the packet, the JLPT people utilize descriptive cartoons to explain what happens when you fail to turn in your application on time. Here are the 3 things you need. 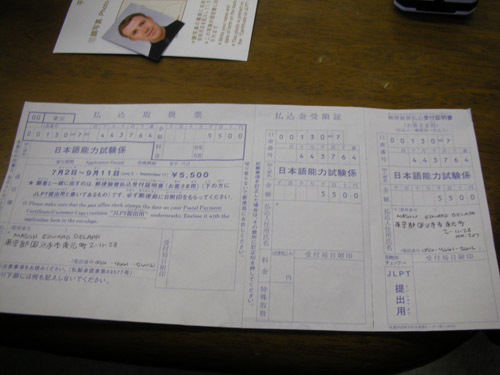 The instruction booklet, the payment form, and the application form. And here I am with my jovial expression. On one side of the application form, you pick and circle from which location you will take the test (I picked Kanto Region since that's where Tokyo is). 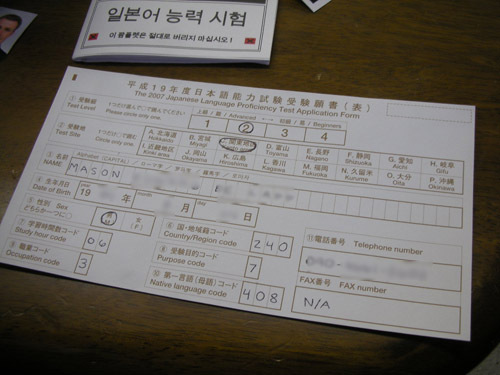 You then fill out basic information like name, birthdate, nationality, and these codes that represent your reason for taking the test, how many hours you've studied, and your native language. Oh, also you have to circle which level you are attempting at the top of the paper (notice the bold cirlce around the "2"...yeaaa). 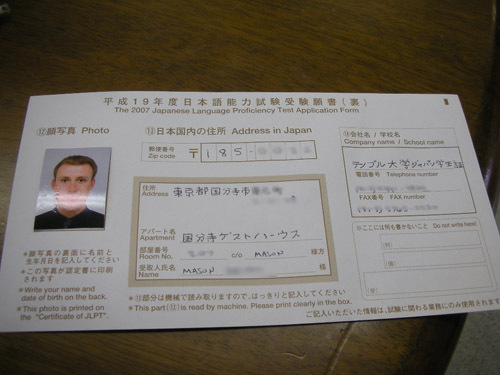 On the opposite side you paste your picture, fill in your address, and the institution you belong to, etc. After that process, you've finished the main piece of paperwork. Next is to move onto the payment for the test. The test fee is (if I remember correctly), 5,000yen ($45). 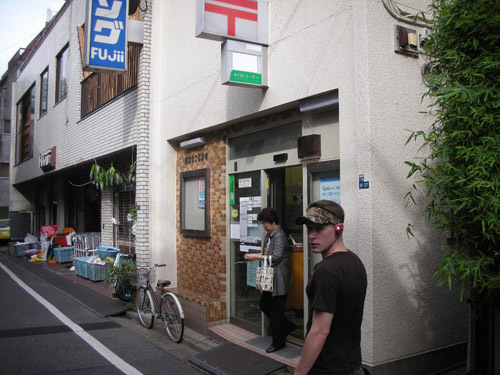 Most of the time with bills in Japan, you pay either at the post office or at the Combini. 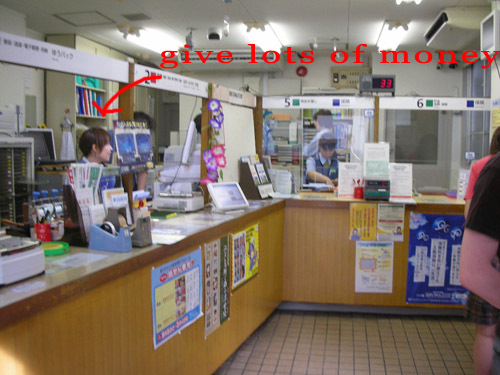 For the JLPT, you are required to do a certified payment at the post office. So with this blue inked piece of paper, fill out all the same info and take everything with you to the next stop. The post office! Right across from the street from Temple University there is a small post office location stuck in a hole in the wall. This is the last stop for today. Here you pay the lady and send off your application. After 2 months after you turn in your application, you receive a piece of paper telling you the address of the testing location and when to exactly be there. Also included is your testing number and various administrative pieces of information. From there you study everyday...alot...a whole lot. This last month or two before the test I'll put every waking free moment into studying (close to 5 hours a day if possible) in hopes of being able to pass that 60% mark. Once you are finished studying for months on end and take the test. In mid Februrary you receive either your failure notice or your certification paper of passing. 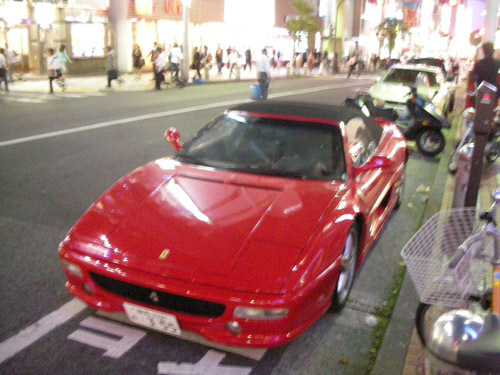 With that, you then get lots of money and buy Ferraris, such as the one above frequently found in Shibuya and Harajuku. 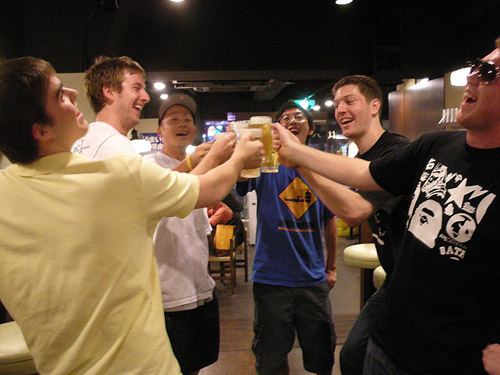 Don't forget to celebrate hard studying with your friends! So after a lengthly month long break where I had a chance to visit my home state of California, it was time to buckle down and get back into the swing of things at school. Fall semester has started and I'm taking a massive load unlike my previous semesters. As a glutton for self-inflicted pain, I am taking 6 business classes, 1 Japanese class, working 20 hours a week at my new job (more on that later), and preparing for 2kyuu on the JLPT (more on that later as well..). I'm really starting to feel the hurt now as I have trouble finding any free time to update the site or have any sort of social life. BUT, after the first week, there was a short lull of activity in my classes giving way to some room for weekend tomfoolery. Just as my law class came to a close, Josh and I left to meet up with several of our friends in the main hall lounge area. It was friday night and time to celebrate seeing all our friends again after the break. We made plans with everyone to go to a nearby restaurant/bar that caters to Temple students with a large discount on alcoholic merchandise (an obvious large deciding factor on where to go). One of my prized posession, which later were destroyed by unnamed parties, were my "stunna shades" which I picked up while back in Cali. Part of an ongoing hip-hop trend turned joke in northern California, these style of oversized aviators turns heads and bring laughs without failure. 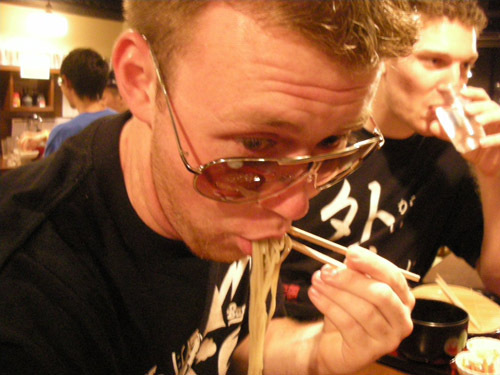 Since noone knows anything about the fad in Japan, they found it all the more interesting that I even had them, and had to give them a whirl themselves. Above you can see Yukari of Gunma looking quite stylish. ...And here is Erika with them on. She looks like a clown they're so oversized for her face. So a short walk down the street from our school there is the before mentioned restaurant owned by a kind fellow named Tetsuya. 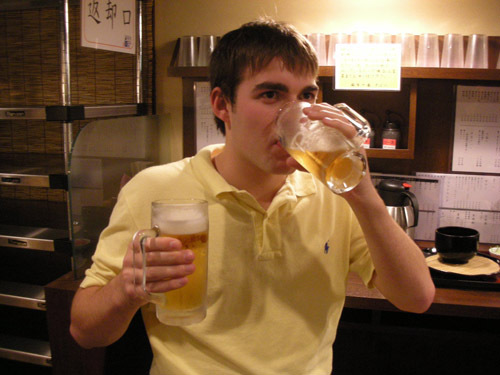 They have a menu devoted for Temple students where the regular priced beer of 500yen, dives down to a low low price of 300yen. That means we can get more beer for less! He also offers 3 different meal sets which you can see me enjoying. You can also see my stupid-faced friend Mark Frank behind me in the background not drinking beer. I guess being a little girl and wearing dresses is cool for some people, to each his own I suppose. Here is the first group picture of many that night. Throughout the evening's festivities, more and more people arrived. 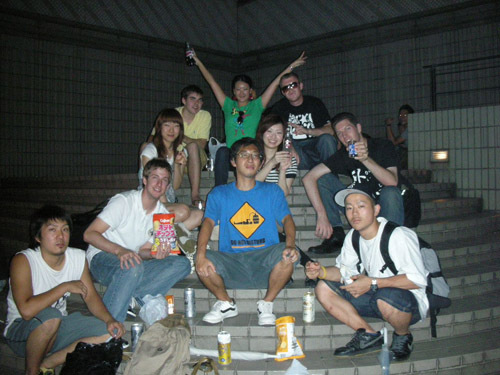 In this picture from left to right around the circle we have Ryan (from Cincinnati, OH), Josh (from Sacramento, CA), Yukari (of the esteemed Gunma prefacture), Yuu (a man who need to pick an American name so we stop having such damn difficult conversations in English), Tempe (of some Japanese area in Japan), Mark Frank (of who the hell cares), the coolest kid ever, Rena, and the legs of Keiko. We're about 3 beers in at this point, not too far in, but about the time we pull out store owners/managers for photo ops. Here is Yukari, Yuu, and Tempe. So every conversation we have as a group where Yuu is involved, is a constant confusion of pronouns. "(me)So are you going to go to work tomorrow?" "(Yuu)No, I don't have a job you know that." "(me)NO Yuu I wasn't talking to you, I was talking to Josh." "(Josh)You were? I thought you were talking to Yuu." "(me)Me? why would I be talking to myself?" "(Josh)I dunno, you are kinda off sometimes.." "(Yuu) Hey!" "(me)Yea he is sometimes huh..". Clearly, this kid needs to pick a nice western name to use while speaking in English. Hey! Ayumi showed up to join the party! 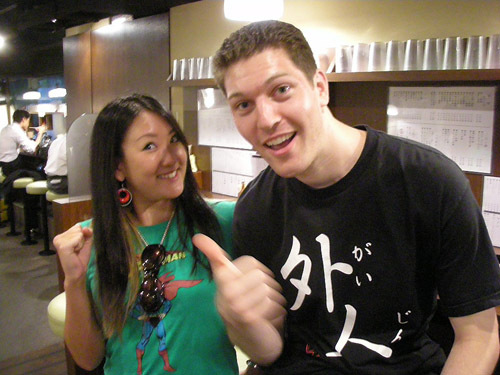 You can also see Mark Frank posing like a tool sporting his "Gaijin" shirt (His shirt literally says "foreigner" in Japanese). 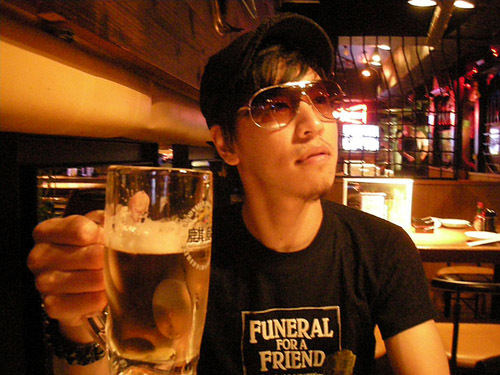 He wears this, understandably so, to differentiate himself from the masses of Japanese people. 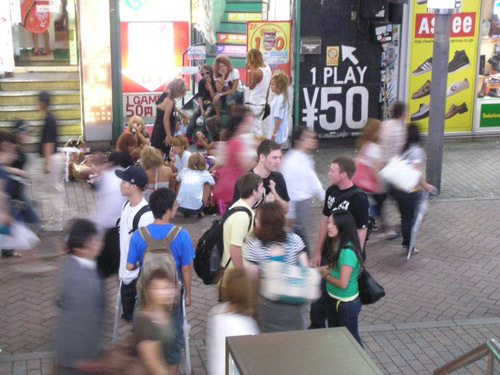 It is sometimes hard to find other 6+ feet tall ultra white foreigners walking in crowds here. They just sort of blend in. Here is Ryan doing what men do. Josh didn't drink any alcoholic beverages during this evenings festivities. 5..or 6 beers in at this point. That means myspace-angeled funny face pictures. Cheers to good times and good friends! I think we're at 7 or more and thinking about wandering to another section of town to sit with cheaper alcohol purchased from a 7/11. Good friends here as well. Ayumi is a cool kid, lucky as well, she just got a new puppy. 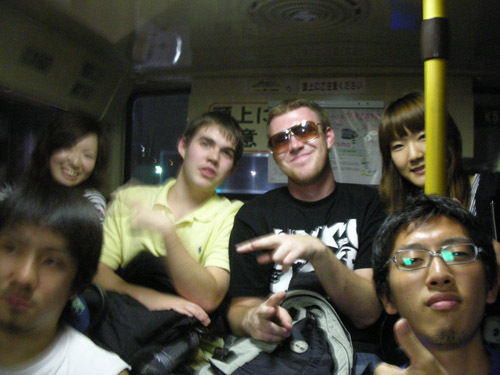 It was then decided, time to head to Shibuya to sit and drink in the streets like a hobo clan. 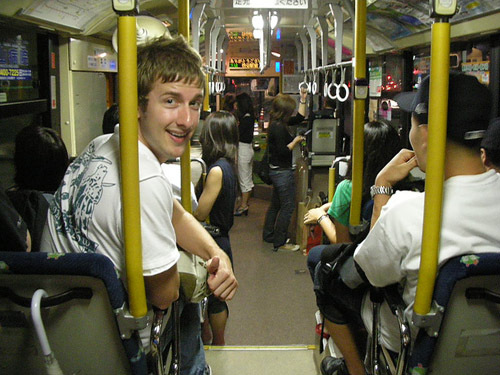 Thumbs up for public transit! 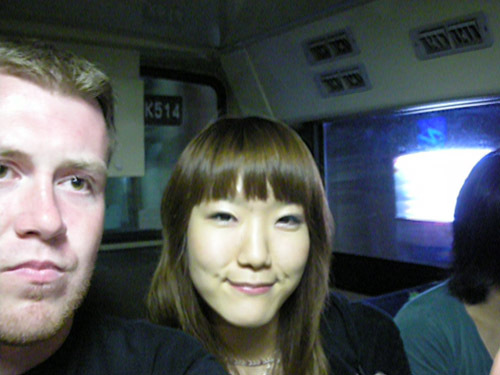 Yukari, Ryan, me, and Keiko sitting in the back of the bus. You can see Yuu, Yuu the person, on the right foreground. 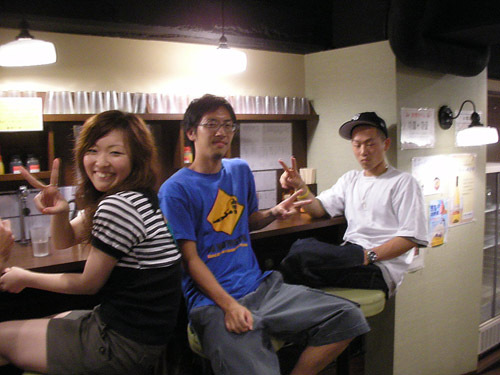 On the blurry left, you can see Yuji who met up with us just as we were leaving the restaurant. Keiko, she's alot meaner then the picture lets on. She once spit a whole mouthful of crackers at me when I was sitting in a sofa. 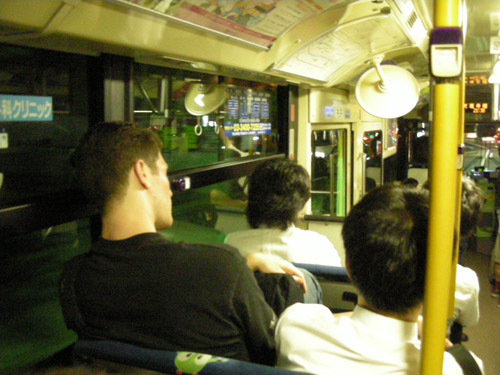 Stupid lanky Mark Frank falling asleep on the bus. He unfortunately woke up when we all ran off the bus. Waking up easily must be one of those traits of little girls who are sober and don't drink beer with their friends. I don't remember what this was but seemed appropriate to share on a public website. So as we first arrived in Shibuya, we all had to use the lavatory as quickly as possible so we ran into HMV (a 7 or 8 storied music/movie store). Everyone looks really excited I know. Here we are headed to a conbini(convenience store) through a main street in Shibuya to restock on cheap refreshing beverages. Hehe, this picture says alot. 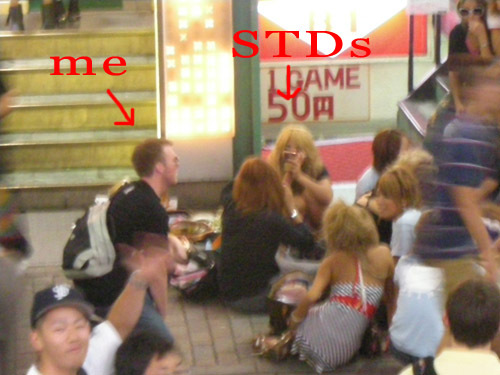 Commonly, in the main/most popular areas of Shibuya, Ganguro girls hang out in large packs sitting in their little pow wows doing nothing. The general feel or known facts of these Shibuya girls is they're rather, uncleased, and will often stay out from home for days at a time. They're kinda weird social rejects from what I've heard and rather promiscuous among their little cliks. I'm sure I'm not doing them any proper justice so follow the above link to learn a bit about them. 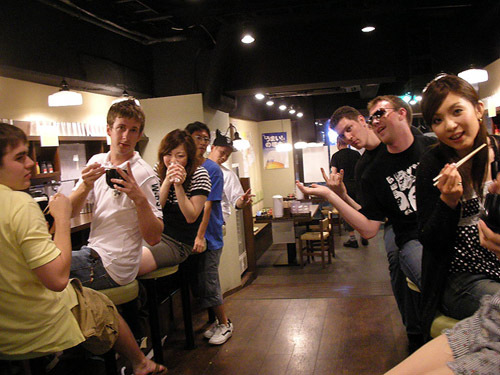 Anyway in this above picture I decided to just go up to the whole group of them and try to pick them up using such lines in Japanese as "Hey I'm American! You're hot! Let's do stuff! Nice face, what happend?!" Yea..it didn't work. After I was completely shot down, I regrouped to continue on with our plans of more happy drinks and a place to sit. And here is where the remainder of our night was spent. These steps were quite a popular choice as there were many other groups of drinking parties around us. Also, there was a pack of Ganguro guys, who by the way were much more friendly than the girls, who were quick to make friends with us and share some of their liquor and interesting stories about life and "fashion".